Our day-to-day lives depends on the country’s 16 sectors of critical infrastructure, which supply food, water, financial services, public health, communications and power along with other networks and systems. A disruption to this system, which is operated via the internet, can have significant and even catastrophic consequences for our nation. The number one risk to critical infrastructure? Spear phishing, which represented 26% of incidents reported to ICS-CERT. Links in email, tweets, posts and online advertising are often how cybercriminals try to access your information. If it looks suspicious, even if you know the source, it’s best to delete or, if appropriate, mark it as junk. If everyone does their part – implementing stronger security practices, raising community awareness, educating vulnerable audiences or training employees – our interconnected world will be safer, more resistant from attacks and more resilient if an attack occurs. 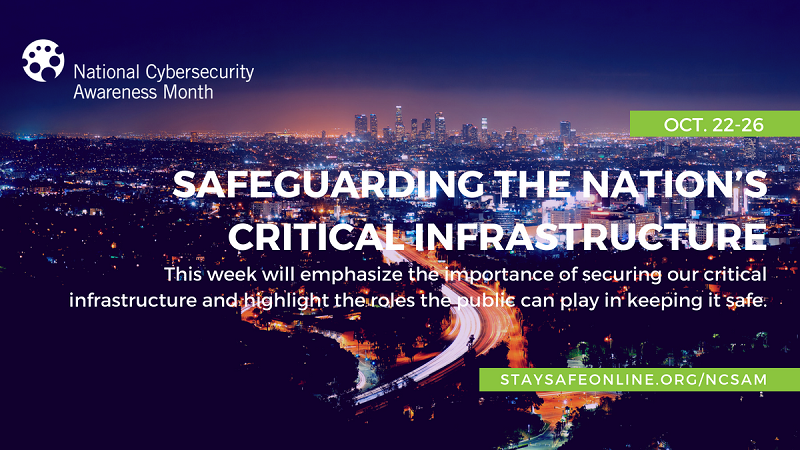 Learn more in the Week 4 infographic, Safeguarding Our Nation’s Critical Infrastructure.